It's a gorgeous day today! A complete 180 from the weather we had the last few days. I loathe gray skies and stormy weather. So, to see the sun out with blue skies and hear the birds chirping outside my window, it makes my heart happy! To know even after a little bit of ugly, the world seems beautiful! 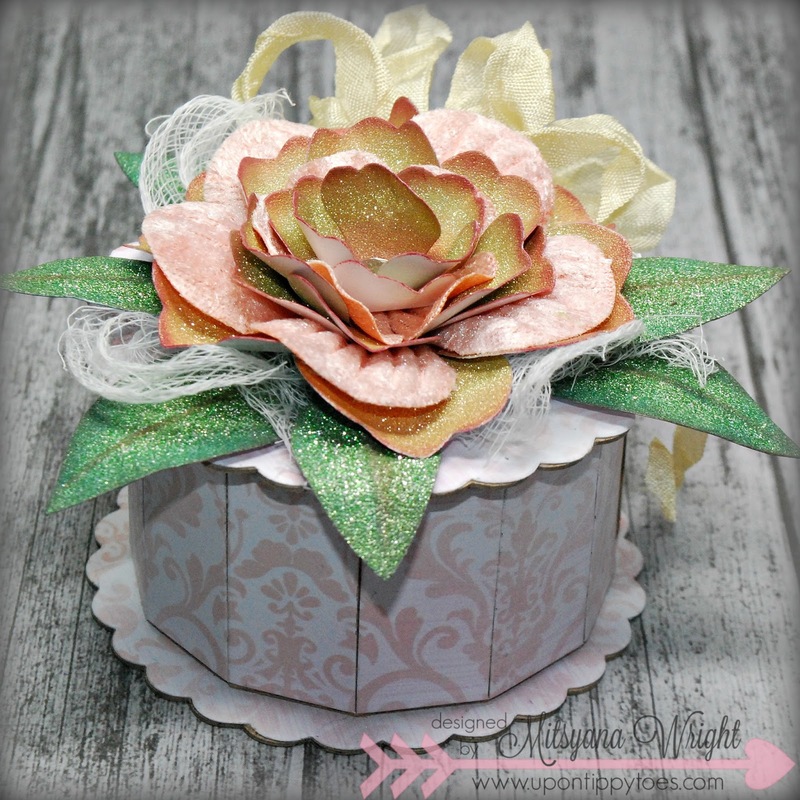 I made this lovely Floral Keepsake Box featuring Eileen Hull Design's dies and her wonderful ColorBox Blends applicators by Clearsnap!! I have been very curious about these blends from Eileen Hull and Clearsnap for quite some time now. I was so ecstatic when I was given the opportunity to play with and create using them. 1) It works as an ink pad and sponge dauber all in one. Cool!! I dount have to struggle looking for a dauber or blending tool when I need one... it's already built in!! 2) It hold up to 10x's MORE ink than traditional ink pad. What, what??!! Yes!! Exactly what I said... 10x's the ink!! It's like having the equivalent to an ink pad and refill bottle in one (actually this applicator contains more fluid than a traditional refill/ reinker bottle). 3)The price point... This applicator cost less than the average ink pad (without a re-inker). These typically runs around $5.50... A steal! !Especially considering that it has a built in re-inker!! Most refills cost 2-3 times that of their ink pad counterparts. When I got the inks in I uncapped the heads and noticed that they were white. I first had to "prime the pump". For my example above, I used one of my large acrylic blocks, faced the applicator sponge side down, and pressed the sponge head in an up and down motion till the ink started to surface. then gently rubbed the sponge into the ink in a circular motion. Press & rub, press & rub, till I got to the the consistency and richness I wanted. So super easy. Now the applicators are ready for inking projects. If at anytime they become dry or I just want the color to be a little more saturated, all I have to do is give it a few more pumps and I'm good to go!! Another AMAZING fact about this project... they are permanent once heat set!! 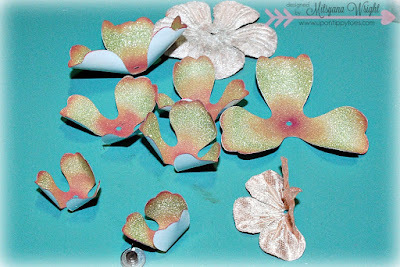 Which is awesome for what I wanted to use them on... Glitter Paper!! For today's project I wanted to use this gorgeous glitter paper! I love bling! And paper is no exception! But with glitter paper ink usually will rub off because the glitter pieces are very similar to that of plastic or, in some cases, metal. These non-porous surfaces make it hard for inks to adhere as there are no pores to sink into. So this was going to be an experiment for me, which I'm happy to report, WORKED!! 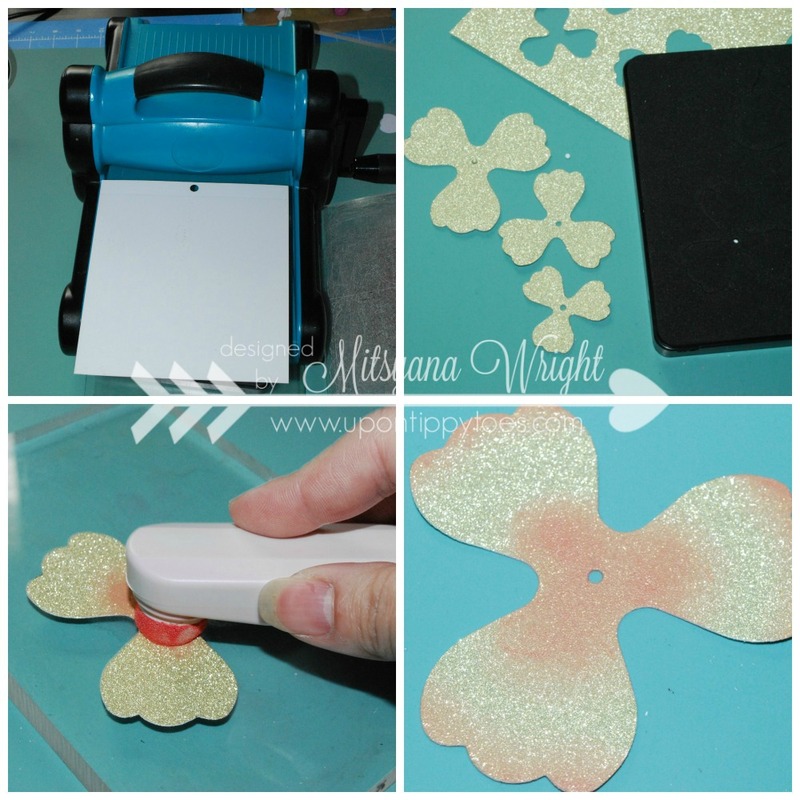 I started off by first, die-cutting my gold glitter paper using Eileen Hull's Pansy flower die. Then used the Melon Blends applicator to add color to the centers and tips of the petals, softly blending it out. I heat set the first layer of color to prevent it from rubbing off. Once these blends are heat set, the color is permanent. They don't go anywhere!! Once the first color was heat set and cooled, I used I added the darker color right over it. I just didn't spread the color out as much so the lighter color was also showing. You can see a big difference layering with a deeper color (lower left pic). It adds so much depth. Heat setting glitter paper naturally makes the edges curl!! Win-win for me!! The curled petals adds volume!! Now I don't need to bring out any special tools and hand curl them! YES!! For a bit of added texture, I decided to mix in a few premade velvet flowers and attached them together with a brad through the center hole. I also die-cut Leaves from glitter paper. This time using green glitter paper with Ocean and Nutmeg Blends. I gave my leaves a vein down the center and inked across the raised edge. Then heat set it to be permanent. This box I wanted so bad and had been at the top of my wish list as soon as it was released. This is Eileen's Cookie Box Die. The scalloped edges are super cute! Well, it finally came in and I knew I had to use it right away. I like to die-cut my paper and chipboard together. Then run my paper pieces into my Creative Station and adhere my pieces onto the chipboard. Then, I fold the box along the crease lines. I use a quick dry liquid adhesive to attach the my chipboard pieces together and added an extra piece (that was intended to be the bottom base) onto the inside of the top cover. When press down it holds the lid in place. Like I said, I wanted the flower to be the focal point so besides using pretty I didn't do much else to this box. It was already very pretty and I didn't want to detract from that. I used more clear adhesive to add my leaves, flower, and a strip of cheesecloth to the top of the box. Why cheesecloth?? 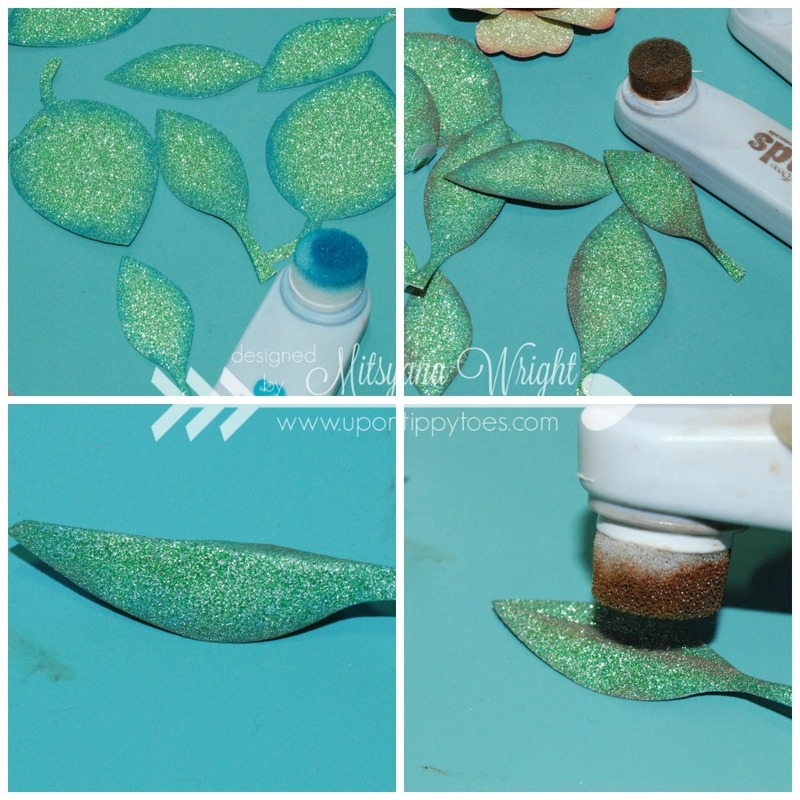 It's a very easy and inexpensive filler that looks gorgeous! 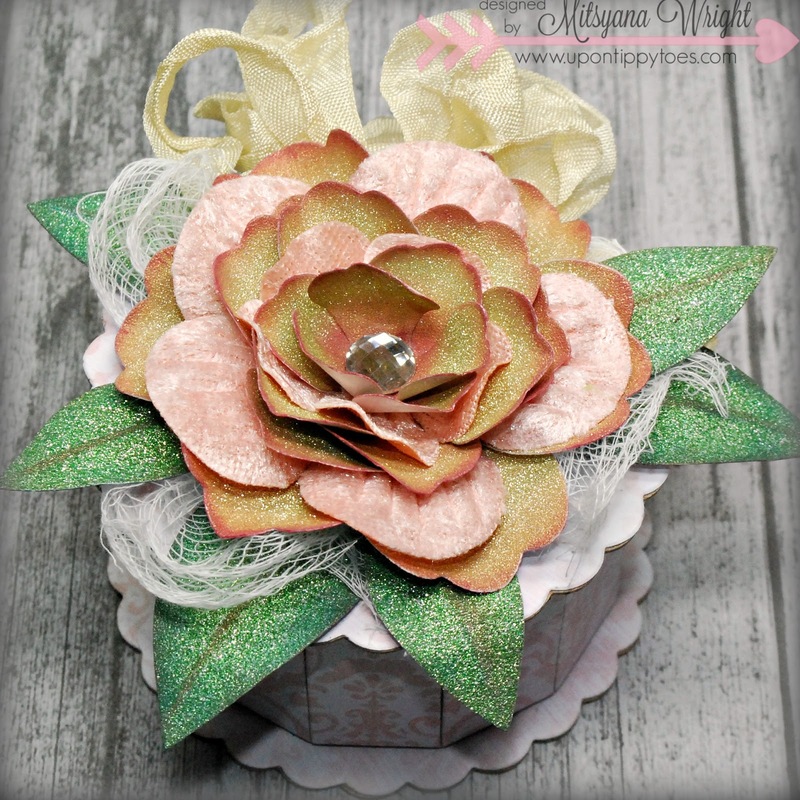 A beautiful floral keepsake box!! It's amazing where an idea might take you! 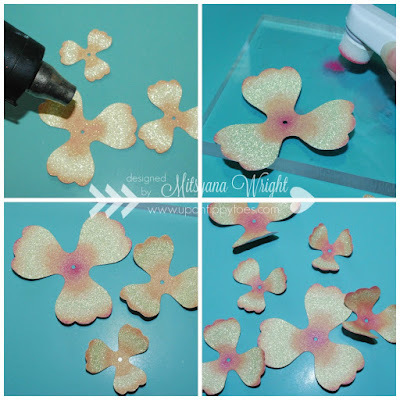 Amazing tutorial - and I love that you used glitter paper. Beautiful! I love how the ink worked on the glitter paper. fab! !